Through a series of Internet coincidence, I ended up playing with Goodreads this weekend, and I was very excited to find out that it has RSS and it also has widgets. Wonderful! I've always wanted to use Goodreads, but I never found something that hooked me. But now... a random quotes widget, with quotes from my books? I am hooked! Back in November, someone I do not know, Suniti Namjoshi, contacted me with questions about the illustrations for Steinhowels Aesop, which is a 15th century illustrated Aesop; I have lots of Steinhowel illustrations at my Aesop websites. She wanted to use the illustrations for a book; I gave her the information she needed. She said she would send me a copy of the book. Well... the book arrived last week, and it is gorgeous! As soon as I read the blurb about the book, I was totally intrigued: I had to read it immediately. So I read the book, and it was fantastic: it's about a time-traveling Sprite (the author herself) who gets pulled back in time to share adventures with Aesop. Brilliant! I've always used a fox as my social media avatar in honor of the foxes in Aesop's fables... now I am even more committed to Aesop-as-fox. And in the process of logging on to Goodreads, it prompted me to link up Goodreads with my Amazon account, so I did... and WOW, that meant it was integrated with my Kindle highlights. I repeat: WOW. That meant I could easily create Goodreads Quotes from My Kindle highlights; just a little copying-and-pasting and presto! Now, the Goodreads site is pretty awful in terms of being covered with ads (some pages way worse than others)... but I saw that they offer widgets. There's a MyQuotes widget right there on my quotes page, with a random item from my quotes. There are other widgets too if you want to share what you're reading, etc. ... but for me it is this quotes widget that really appeals! Goodreads: Random Quotes ... click and see what quote shows up for you! This past weekend I wrote a quick post about a couple of alarming edu-bot articles I had read during the week... and I am so glad now to share this GREAT ARTICLE from Michelle Pacansky-Brock about bots v. humans in education, and why students need and deserve human education: Teaching in the Era of Bots: Students Need Humans Now More Than Ever. As promised in the previous post about the auto-bots (Bots and Other Automated Feedback: Clippy's Revenge), I wanted to say something about an exciting new feedback thing I am doing right now in my classes: brainstorming with the students about how to help them do a better job with feedback. I'll have more to say about this when I get input from more students, but just based on the 20 responses I've gotten so far to my survey, I am feeling so much more confident about designing some really good experiments to try for next year. In this post, I'll share the questions I am asking the students, and then provide a little context about how this works in my classes. Feedback Gallery: I am asking the students to share with me two examples of really useful feedback they received from other students, and two examples of not-useful feedback. That way I can create a gallery of examples to share with future students; there are a lot of students who learn best from seeing actual examples that come from actual students. I think this Gallery is going to be a big help in addition to the other materials I use to help students practice and improve their feedback skills (on that, see below). 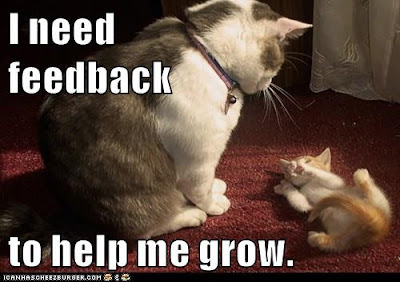 Assess the semester: I'm asking the students to rate the quality of the feedback they are both giving and receiving (both from other students and from me), and asking for suggestions about how I can do a better job of providing feedback. Help me to brainstorm: This is the exciting part! I brainstormed a whole bunch of ideas (some of which I am more enthusiastic about than others, of course)... and I'm asking the students to let me know which possibilities really appeal and also the ones that strongly do NOT appeal, plus getting more suggestions from them. And I'm getting some really good suggestions so far! That means I can start off the summer with a ton of ideas, some sense of student interest, in order to come up with some changes to the feedback process next year. So, I'll report back on all of that later, but I was so encouraged when I took a look at the first batch of student responses; there will be a lot more responses tonight, plus I hope to pick up some more responses when I write to the students who are already done with the class, asking them to do me a favor and fill out the Form. I've got 90 students in my classes, so that is a lot of input... and I need some help because this is a really big challenge in course design, and I want to make good choices for my new efforts next year. Some quick context: every week students comment on each other's blogs in a way that is mostly social, and they also do substantive comments on each other's Projects each week. Because they are working on the Projects all semester long (revising, adding new material, revising), the feedback is really important: comments from their readers are a big part of figuring out what to work on as they revise. For many students, providing feedback is really difficult. They often have little or no experience in doing that; they might be feeling very unconfident themselves as writers; there are lots of emotional undercurrents in both giving and receiving feedback, etc. etc. I know how hard it is because I have been working literally for years on improving the feedback that I give to students: it's my full-time job, and I'm still learning! Right now, the main way I've been trying to help students with feedback is by modeling (they are getting feedback from me every week), and also by providing three weeks of preparatory materials where they learn about both getting feedback (here's that assignment) and giving feedback (here's that assignment), along with a few specific strategies to practice (here's that assignment). Because I situate feedback in the context of growth mindset, they also get reinforcement from the growth mindset materials in class... like the feedback cats! I need feedback to help me grow. This article is about yet another attempt to have computers "assess" student writing. The absurdity of such efforts has been well documented elsewhere, but if you are not up on the topic, this article is a good place to start. Yes, machines can provide grades comparable to the grades that humans assign, but that is simply because humans themselves are grading like machines, a process that works much better when the students in turn write like machines, producing the words and phrases and sentences that are expected of them in formulaic fashion. I have very strong feelings about this: if you do not have a meaningful purpose for student writing so that some audience (you, other students, family, friends) will read the student's writing with pleasure, then just give the students a test instead, something suitable for machine-scoring with right/wrong answers. We should not use writing as a proxy for testing. Instead, we should use writing in order to communicate something of importance, person to person. If the writing has no meaning to the student or to the class or to you, the teacher, it's not a good solution to have a machine to "read" the writing and assess it; quite the contrary: I can think of no better way to convince students that their writing has no real value for anyone. The Pearson story was a question about the ethics of using student performance for research purposes without the students knowing that they were research subjects; what concerned me was the study itself, which was testing the effects of totally automated feedback about student performance: when students got a question wrong, they received either "growth mindset" feedback messages (e.g. "No one is born a great programmer. Success takes hours and hours of practice") or "anchoring of effect" feedback messages (e.g. "Some students tried this question 26 times! Don’t worry if it takes you a few tries to get it right"), or no "special messages" at all. The messages apparently had no positive effect, which does not surprise me: there is nothing "special" about getting automated feedback messages. In fact, it seems that these messages may have in some weird way discouraged the students from attempting more problems (see the article for details). I would call it the Microsoft-Clippy effect: don't bother me! I'm working! In a separate blog post, I'll write up something about an effort I'm making in my classes to do a better job with audience feedback about student writing. Real comments from a real audience that, I hope, can be really useful as students work on their writing. More on that in a bit. Meanwhile, here is some Clippy humor. Yes, I'm old. There are probably some people reading this who are too young to remember Clippy ha ha. Lucky you! He has his own Wikipedia article: Office Assistant. I had a great meeting with Adam Williams and other folks from the awesome Canvas Community team last week, brainstorming about some ways to bring more remote participants into the #InstCon conversations, which will also provide conference attendees new/more opportunities to connect and share what's going on at InstructureCon. During that conversation, I mentioned the efforts made at OLCInnovate last week to connect via Twitter, and I was involved with that as a remote participant: I did an OLCLive remote presentation about un-grading, and I also participated as a remote audience member in an OLC presentation, plus I was a remote panelist for a Virtually Connecting session; I should write up a blog post about the great people of Virtually Connecting too! Those were all video events, and I also participated at Twitter, of course, mostly by retweeting. So, the main hashtage for OLCInnovate was, surprise surprise, #OLCInnovate. You can see what that stream looks like at Twitter: #OLCInnovate at Twitter. For a very different perspective, you can use this TAGSExplorer built by Martin Hawksey. It's fabulous! I hope we will use it for #InstCon also (Adam can check with the social media group and see if this is a tool they already use; it's been around for a while). The main page is here: TAGSExplorer for #OLCInnovate. Adam is hoping to get some metrics about Twitter participation, and Martin's Twitter toolkit is definitely the way to do that. I've seen this used for many conferences, and it's also been a tool people have used in MOOCs I have participated in where Twitter was one of the MOOC spaces. Then, you can also search on other hashtags that appeared in the #OLCInnovate tweets, conversationalists (which measures interactions), and also search the archive. I chimed it at the comments there; maybe others will do so also! Content Recycling: "From yesterday's Twitter..." : I've updated this to a more systematic harvesting of content from Twitter. Cartoons and Other Summer Fun at Twitter : this is an example of a Twitter list that I get so much good content from! As I've written here previously, one of my big struggles with class content is how to surface that content as students choose what to read and what to comment on. I rely a lot on randomizers, but I was excited to learn about this slideshow program: Photosnack. Gideon Williams mentioned it in a discussion about image galleries. I am REALLY glad I found this. You can use Photosnack to create a slideshow that is meant to be embedded somewhere. It will grab the file names as captions when you upload the images, and you can also have those captions be clickable links; that is ESSENTIAL for me. It's never fun to find out that a web-based service you used is making changes, and Twitter is making some big changes to the way its widgets work; I just found out about that last weekend, thanks to Alan Levine and Robin de Rosa whom I follow at Twitter. For the past couple of years, Twitter has effectively been running two widget systems: an old system accessed through Settings-Widgets, and a new system accessed at publish.twitter.com. As of July 27, the old widget system is being retired. That means people who created widgets with the old system will have to replace their old widget code with new code. That's really not too much trouble... but there is one BIG problem: the new widget system apparently will not support hashtag widgets. All the other widgets will work (Profiles, Likes, Lists, Collections), but not the Search/Hashtag. Given that hashtags are one of the most powerful features of Twitter, it is very frustrating to find out that we will not be able to display live hashtag streams with widgets anymore. I'll discuss alternatives in later posts. Right now, though, my immediate concern is to make sure that my Twitter4Canvas materials match up with the new system. When I first started promoting Twitter4Canvas, I was using the old widget system. I then started using the new system, but my Twitter4Canvas support materials were a messy hodgepodge of both systems. And, truth be told, that is mostly Twitter's fault: they never explained what exactly was going on, and when they did finally share the news, Deprecating Widget Settings, it was still pretty confusing. I might even be wrong about the hashtag widgets; Alan Levine and I are both participating right now in a related forum topic here, trying to get answers to that question: Replacing Deprecated Timeline Search Widget. The Homepage links directly to the simple Step 1-2-3 instructions for creating your Twitter widgets and publishing them in Canvas. I've also embedded this blog feed on the homepage so you can see my latest Twitter4Canvas blog posts there. Ready-to-Use: I've reconfigured all the ready-to-use widgets (just copy-and-paste!) so that they conform to the new Twitter widget system. Contact: I've got a contact page where people can ask questions, make suggestions, and request additional ready-to-use widgets. I'll have more to say about all of that later, but I wanted to write up something now about changes to that site. I'm still not thrilled with the way Twitter has handled this widget system transition, but I am glad at least that it made me clean up my Twitter4Canvas course space! For several years now, I've had two separate Twitter accounts: OnlineCrsLady is my personal (i.e. professional) account, while OnlineMythIndia is my class account which contains content I share for my students. It was when I created that class account a few years ago that my use of Twitter skyrocketed. Having the two accounts helped clarify in my own mind just what I was doing at Twitter... and since I was trying to do two very different things (connect and share with colleagues, find and share content with students), I was finding it hard to do that with just one account. There is some overlap: each day, I'll usually retweet some items from my OnlineCrsLady stream at my class account and vice versa... but mostly they are pretty separate. For both accounts, I do all my reading via lists or hashtags, and I have very different lists and follow different hashtags for each one. 1. Go to publish.twitter.com to get the code from Twitter. 2. Upload the code in an html File in Canvas. 3. Iframe the File into a Canvas Page. Screenshot ... but click on the Page link to see it in real time! Yesterday I promised a post about lists, but instead of an Indian art post, I am going to create a list of word-related Twitter accounts since that is something that could potentially be of use to anyone. So, to do that, I will log on at my class Twitter account, OnlineMythIndia, and create a new list with the word-related Twitter accounts I follow now. To do that, I just pick one such account, click on the three dots to the right of the "follow" button and choose Add/Remove from Lists. Then I "create a list" and then save it (public by default, although you can make private lists). Now I click the checkbox next to the new item that appears on my list of lists, and then click X in the upper-right hand corner. What you will find there is all the tweets and retweets from the members of the list. Anybody can look at the list and you can also subscribe to the list if you want, but only the list owner (me) can add/remove accounts from the list. So, now I will create a widget from that list; again, anyone can do that! You can make a widget from any public Twitter list, not just one that you created. As you can see, the height is there in the code, so I can adjust that as needed; I don't have to recreate the script just to change that value. I don't worry about the width; I'll be adjusting that in the iframe itself. I've set the width of the iframe to 400 pixels as you can see there. Create Page and Insert Snippet. It's a lively list which will be featuring new content all the time!